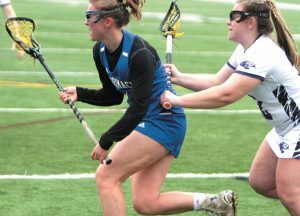 Merrimack placed sixth out of 22 teams on Saturday at the Concord Capital City Classic. The Tomahawks were the top Division II team, finishing two points ahead of Windham, and it was the program’s best showing in the standings at the event. Julien Hovan (132 pounds) and Brendan Parr (145) led the way for Merrimack with fourth-place finishes in their respective weight classes. Dom Damata (195), Kent Dow (126) placed fifth, while Adam Black (220) and Eric Griffin (182) were sixth. Stephen Licata had a hat trick for the Tomahawks on Jan. 26. Alec Bronchuck, Remy Tupper and John Tiano each had goals while Tupper added three assists. Zach Stimeling and Zach Richard each had an assist, as well. Dennis Rattunde had 13 stops in goal for the Tomahawks, who led the entire game. John Tiano scored off assists from Greg Bourque and Alec Bronchuck, but the Tomahawks (3-5-1) were defeated at home despite 19 saves from Greg Amato. Zack Stimeling and Stephen Licata tallied one goal and one assist apiece to pace the Tomahawks (4-5-1) to victory at Portsmouth-Newmarket. Matt Warrington and Owen Hastings also scored for Merrimack, and Remy Tupper had two assists. Owen O’Brien and Isaiah Kepnes each contributed a helper, while Greg Amato made 17 saves. Amanda Wetmore and Marissa Sweeney led the way for the Broncos with 17 and 16 points respectively. Sweeney added nine rebounds to the cause. Jolie Jacoby had nine points for Merrimack.